When the 10-mile stretch of the A417 between Cirencester and Nettleton Bottom became a dual carriageway in 1997, only two landowners had their iconic Cotswold drystone walls rebuilt by the Highways Agency – Prince Charles and the owner of Highgate Farm at Elkstone. It’s fair to say that the improvement to the A417 – which can be just about seen, and certainly not heard, from the first floor of the farmhouse – was the biggest change to happen to the farm in decades, where vintage tractors still peep out from stone barns. But now, nearly 60 years of agricultural tradition is coming to an end, as the landowner – whose father bought the farm in 1954 – prepares to sell the farmhouse, estate cottages, outbuildings, farmland and even his fleet of tractors and machinery, both vintage and modern. The disposal starts with an auction of agricultural machinery and equipment, which takes place from noon on Tuesday, June 12 at the farm. Mark Hill, senior partner at Moore Allen & Innocent in Cirencester, will be conducting the auction. Some of the tractors – like the circa 1956 ‘Little Grey Fergie’ Ferguson tractor with the adorable registration plate SAD 690 – will appeal to collectors of vintage machinery, while the modern tractors and a combine harvester have attracted interest from as far afield as Aberdeen and Perth. 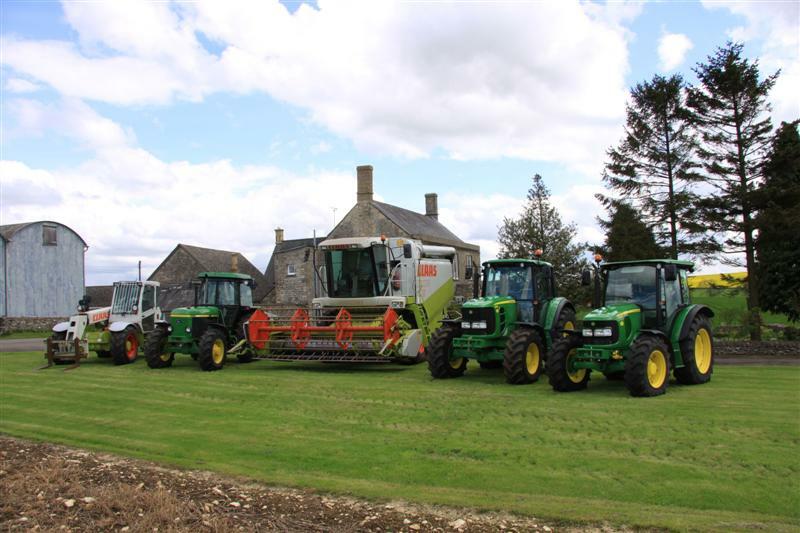 “Most of the tractors have been owned since new and kept in immaculate condition,” said Mark. “There’s an L registered John Deere 3350 which has under 1,800 hours on the clock – you’d expect a tractor of that age to have done seven or eight thousand hours. The six bedroom farmhouse – which sits in 63 acres almost exactly halfway between Cirencester and Cheltenham – is the jewel in the crown of Highgate Farm. The oldest part of the property – currently a spacious dining room, with an inglenook fireplace, timber beam, exposed stone walls and flagstone floor – dates back to the early 1700s. The farmhouse has been considerably extended over its 300-year lifespan, and the rooms have been designed to large proportions. Along with the dining room on the ground floor there are a sitting room, drawing room, a kitchen with adjoining walk-in pantry and separate utility room, a small office and a games room with enough space for a full size snooker table, table tennis table, and room to spare. Upstairs there are four double bedrooms, with views across the Cotswolds in the direction Miserden and the Golden Valley. The attic houses another two bedrooms, while a loft above the games room, accessible from a set of tallet stone steps outside the farmhouse, provides bags of storage. A charming stone well sits within the beautifully maintained gardens, which are mainly laid to lawn with flower borders and bounded by Cotswold stone walls. To the rear of the farmhouse and the farmyard and outbuildings. The outbuildings include a five bay covered yard, a grain store and drier, a six bay Cotswold stone tallet barn with external steps to a loft, two Cotswold stone barns, a Cotswold stone cart shed, a former milking parlour and an implement barn. The farmhouse sits to the southwest of 60 acres of farmland, divided into four field enclosures. 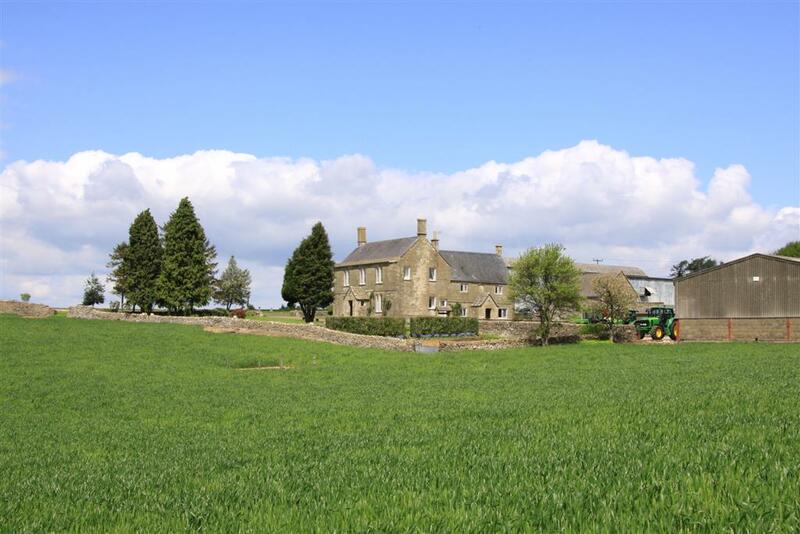 The farmhouse, outbuildings and 60 acres are being offered for sale with a guide price of £1.3 million. Being sold together, or as a separate lot, is a further 161 acres of arable land, divided into five pastures, which span the downland between the northern boundary of the 60 acres around the farmhouse and Cowley Wood to the north. The land carries a guide price of £1 million. Also offered for sale are a pair of charming semi-detached Cotswold stone cottages, which sit in a pretty position in the middle of the farm, with far reaching views across the surrounding countryside. Each cottage is accessed by a lean-to boot room, connected to the kitchen. The family bathroom is on the ground floor, and a living room boasts an open fireplace. Upstairs there are three bedrooms. Each of the cottages stands in an extensive garden, bounded with Cotswold stone walls, with garage and store. To the rear of the cottages there is a pretty wood of mature beech trees. Each of the cottages carries a guide price of £220,000. Whilst the buyer of the farmhouse will be given first refusal on the remainder of the estate, there is every chance that the cottages will be sold separately, and interested parties are urged to express their interest with the agents.